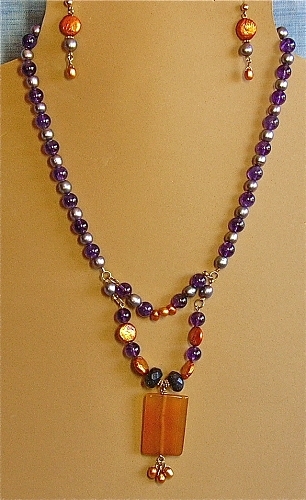 18 inch (20 inch - longer strand) "Purple and Gold" amber-colored pendant [approx. 7/8 x 1-3/8 inch] Pearls, faceted Goldstone, Glass, 14K GF Necklace, lobster claw clasp, and/or matching earrings. Great gift for high school or college students or alumni: Purple and Gold! Check out the chakras for violet, orange and gold. Pearls are for the 3rd and 30th Anniversaries, and are a birthstone for a June Birthday.